A few blog posts ago I shared my love of French Macarons and since these little buggers can be expensive, I decided to try making my own. While researching recipes I read that not only are they expensive, but they can be tricky to make. Since my overall goal for 2013 is to step out of my comfort zone without fear or worry, I continued on. This weekend I made my first-ever batch of chocolate French Macarons. I’m happy to report that the texture of my macarons turned out properly. A slightly crunchy shell with a chewy interior. The frosting in the middle was a bit sweeter than I like, but not bad. A close-up shows they’re not quite perfect in form, but this was my first attempt, after all. This was also my first experience ever using a pastry bag. This part needs some work. 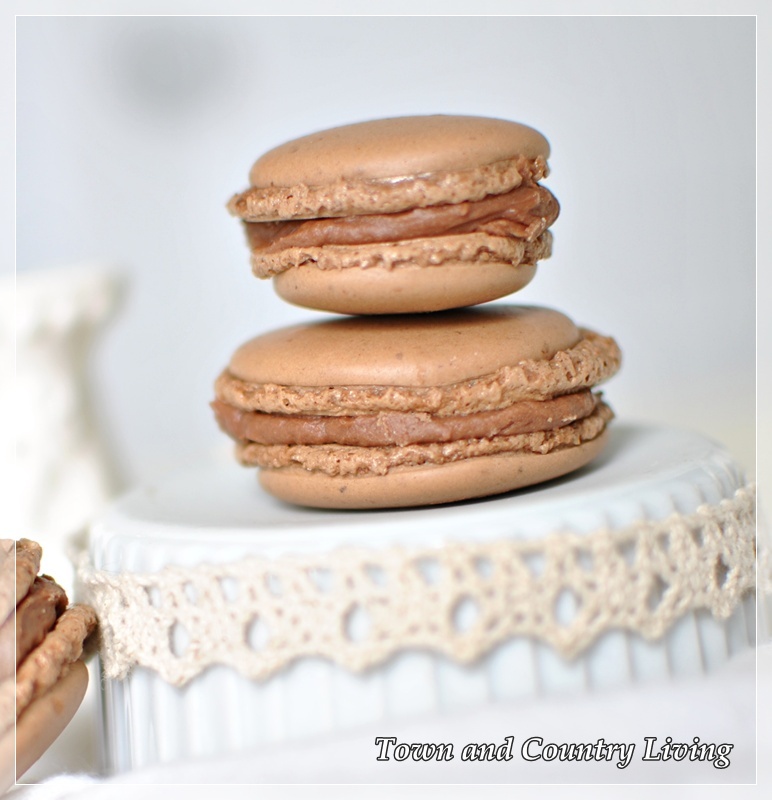 Practice makes perfect as they say and I’m sure with a lot of practice my French Macarons will be better formed. This is the cookbook I found at Barne’s and Nobles, on sale for just under $10. 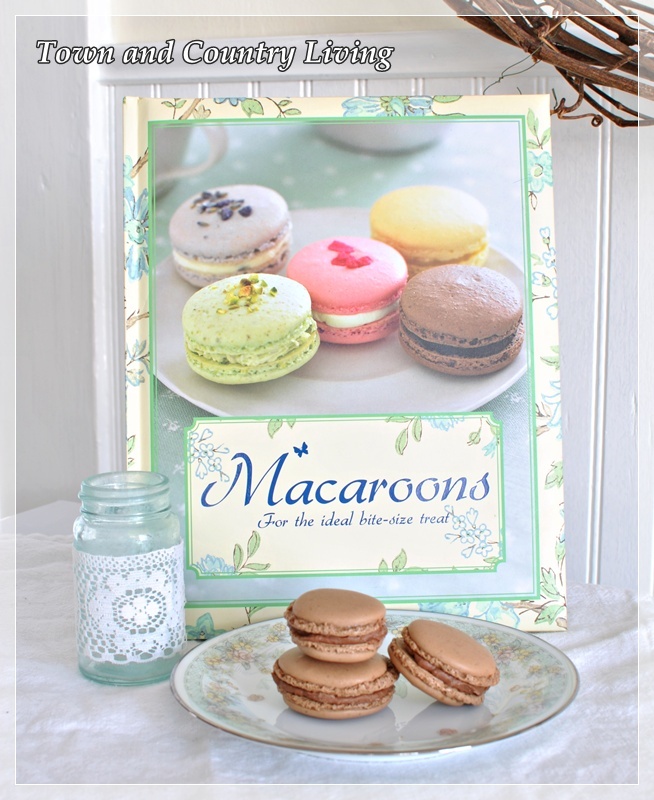 What I like about the cookbook is that it includes helpful hints at the beginning and there are numerous recipes for different flavored macarons. Following is the recipe I used, with a slight adaptation. Place ground almonds, confectioner’s sugar, and cocoa in a blender and blend thoroughly. Sift mixture into a bowl (the sifting part is important so don’t skip this). Whip the egg whites in a large bowl until they hold soft peaks. Gradually add the superfine sugar while whipping to make a firm, glossy meringue. Using spatula, fold the almond mixture into the meringue, one-third at a time. Continue to cut and fold the mixture until a shiny batter with thick, ribbon consistency is formed. Pour the batter into a pastry bag with a one-half inch round tip. Pipe the batter into small circles onto parchment paper-lined baking sheets. Tap the baking sheets firmly onto counter to remove air bubbles in the cookie dough. Let stand at room temperature for 30 minutes. Preheat oven to 325 degrees and bake in preheated oven for 10 to 15 minutes (mine were done in 10 minutes). Cool for 10 minutes and then peel from parchment paper. Cool completely before filling. To make filling, heat the heavy cream in saucepan until just boiling, then pour over the finely chopped chocolate in a bowl. Stir until the chocolate is completely melted. Add confectioner’s sugar to mixture gradually. Add more if filling is too thin. Spread filling on cookie and sandwich pairs together. 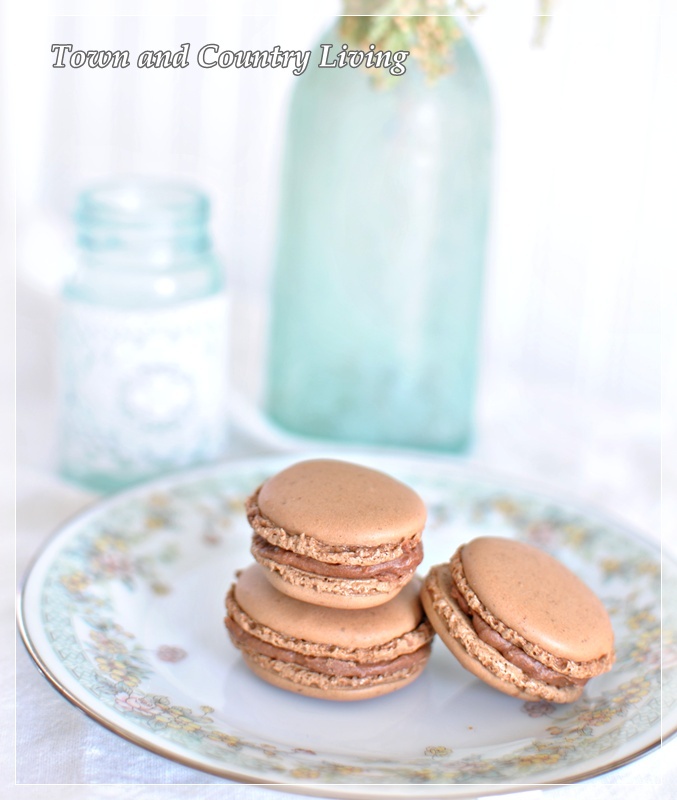 Important Note: Before I talk about the macarons – first let me say that I’ve moved over to WordPress and updates may no longer appear in your blog roll. If you want to continue to have my new posts appear in your blog roll, please add the new web address of http://www.town-n-country-living.com or the new feedburner of http://feeds.feedburner.com/TownAndCountryLiving. Another Note: My kitchen is being featured today over at Savvy Southern Style. If you haven’t visited Kim’s blog before, you will love it! Those look so good. Can’t wait to try them in France in September. Congrats on the move to WP. I just don’t have the nerve. These look gorgeous! 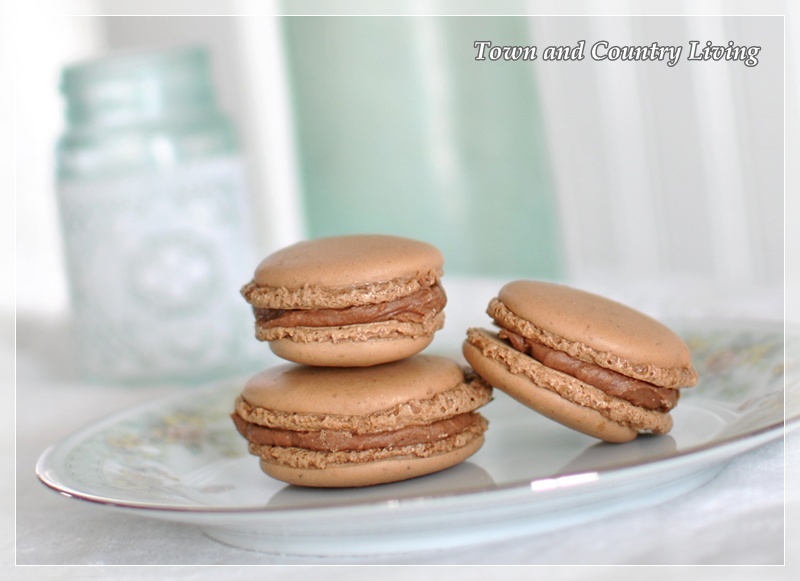 I love macarons but have been intimidated to try making them myself. Yumm, those look so good. I get to go to a French baker when I visit Amarillo but that isn’t nearly often enough and they do not have chocolate one. I will definitely have to look for the book then I can have them any time I like. Those look great Jennifer! I bet they taste amazing too! they’re almost too pretty to eat!! I’ve never had one but they look so yummy! Thank you for posting this recipe!! I was just in Paris and crave these little buggers ALL the time! You are so right, they are very pricey to purchase from bakeries. I too will step out of my comfort zone and attempt to make a batch. Thanks for the encouragement! Lovely,I have always wondered how these were made. They look so pretty when all the colours are together. Yours look near perfect. I must try this recipe. I also adore macarons! I have been making them for a year now, and that was not the easiest thing to learn to do. I will definitely try your chocolate recipe! My family can’t get enough of them – and they make beautiful gifts. I love french food – tastes as good as it looks 🙂 BTW, I took a macaron class here in my area from Sur La Table, and she had paper templates with circles drawn onto them, that we placed under our parchement, and then piped onto the parchment. Then you just slide them out, and place them under your next parchment sheet. Made things a lot easier. Also, in our humid area it can take 1-2 hours before the tops set firmly, instead of 30 minutes. 🙂 Humid pacific northwest. Love your pics, and I want to eat those Macarons! Love it Jennifer…I want to make some for my daughter’s birthday….your photos are so beautiful. yummmmmm. i have made macarons a few times and need much more practice. next time i am going to try almond flour to avoid any grit. your styling and photos look divine!